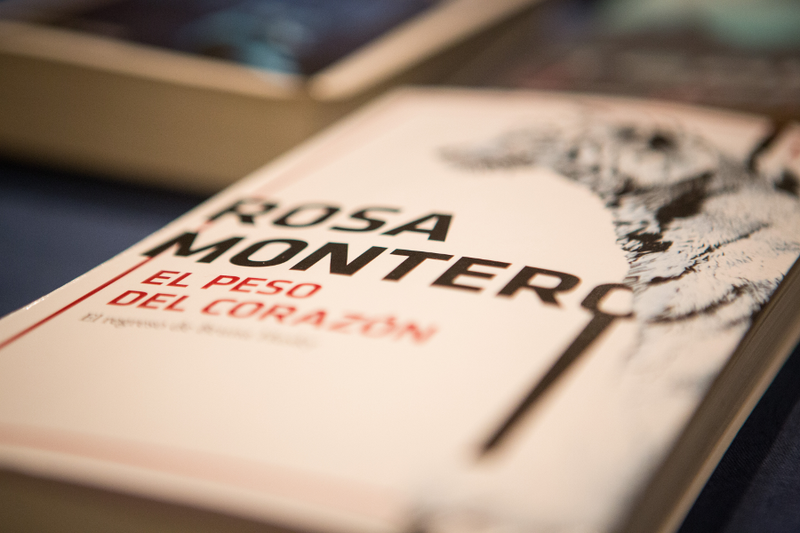 Rosa Montero, award-winning author and journalist, came to BYU for the international release of her newest novel and to teach faculty and students about what it takes to be an author. Rosa Montero understands this principle. 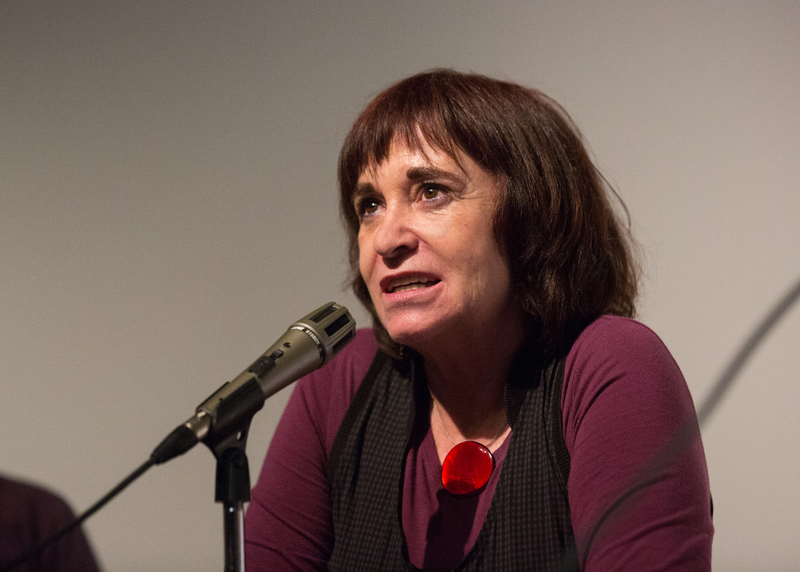 For over 35 years, she has been devoted to writing fiction that captures human struggle and growth, while also making a name for herself as one of Spain’s foremost journalists. Her novels are studied in universities around the world, including Brigham Young University. 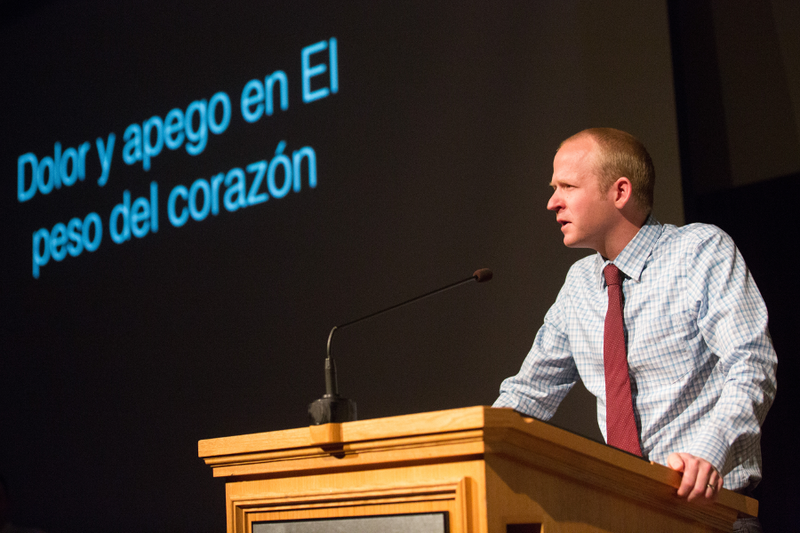 “Rosa Montero is without a doubt one of the most important contemporary writers in Spain and in the Spanish-speaking world,” said assistant professor of Spanish Greg Stallings, speaking on behalf of the Department of Spanish and Portuguese. It came as an honor then when Montero chose to come to BYU for the international release of her latest science fiction novel, El peso del corazón. While here, Montero took the time to teach faculty and students about the craft of science fiction and the state of the modern writing scene, delivering two lectures and teaching a brief but intensive course in creative writing. Montero kicked off her visit to BYU and her book release with a presentation of her novel, where she was joined by Dale Pratt, Juan Carlos Martin Galvan and Todd Mack, all professors of Spanish and fans of Montero’s work. Montero and the professors focused on the themes present in her book and the strengths of the science fiction genre in addressing them. Previously released in Spain in February, El peso del corazón is the sequel to Montero’s novel Llágrimas en la lluvia (now available in English). Both novels are set in Madrid in the year 2109 and follow the exploits of Bruna Husky, a “biological android” cloned and born in a tank, working as a private investigator. Bruna is but one fantastic feature of a world filled with humans, androids and everything in between. “This world is an extrapolation of our own,” said Pratt while describing the setting of the Bruna Husky books. Though some critics would brush science fiction off as an entirely escapist genre, Pratt and his associates recognize it as a powerful tool for investigating the human condition. This tool becomes increasingly appropriate as society grows more and more reliant on technology. Already, criticism abounds that technology alienates us from ourselves. 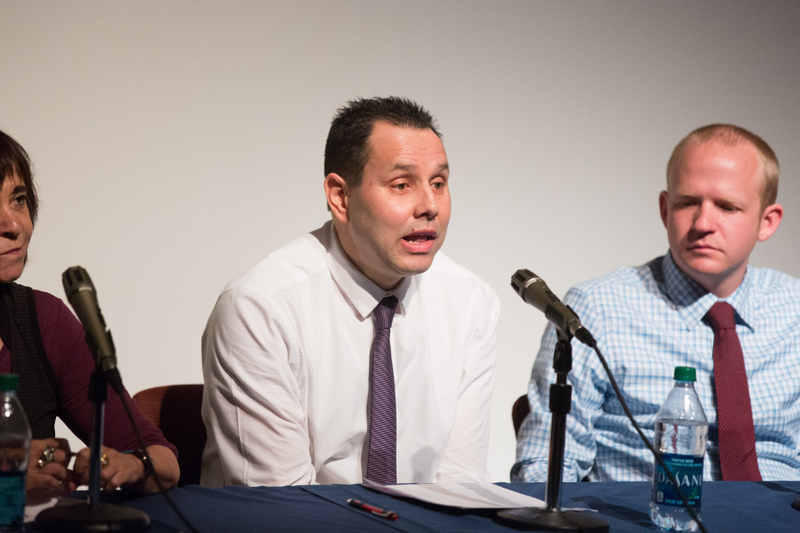 Galvan, associate professor of Spanish language and literature at Stonehill College, explained the double-edged argument: technology can increase intelligence, strengthen immunity and lengthen human life, but if taken too far, it can mark the end of the human species and the start of something new. “Technology,” he said, “be it genetic, robotic, information or nanotechnology, affects not only our body, mind and personality, but can also affect our very soul.” Throughout both novels, Bruna fights to come to terms with what it means to be human when most of her body is artificial. Montero further uses science fiction to explore the relationships that humans build with one another. Mack, assistant professor of Spanish at Southern Utah University, identified Bruna’s search for companionship as illustrative of attachment theory. “All human beings have a need to relate ourselves to others,” Mack said. “It’s instinctive. When we’re born we latch on to our mothers.” This continues from childhood through adulthood as we reach out to others, building relationships in response to pain or fatigue, connecting in order to survive. Bruna, despite (or perhaps because of) her artificial nature, experiences this need in full and searches for connection in a world she feels excluded from. While the rest of Montero’s writing is largely contemporary fiction, Montero considers both Bruna Husky books to be the most realistic and personal novels she has written to date. It doesn’t matter that she and her readers aren’t artificial life forms like Bruna – the struggle to find acceptance and connection is one that everyone must go through. If that is the case, she has been learning for a long time. Montero’s earliest memories are of writing fiction; she composed her first stories at five years of age, mostly, she admits, about talking mice. However, in order to support herself as an adult, she recognized the need for a second career option. She studied both psychology and journalism while attending college and became a published journalist when she was 19. Her first novel, Crónica del desamor, was published eight years later. Over the course of her career, Montero has seen the publishing industry change dramatically, and today the book trade is a much more aggressive environment than when she entered. Before the digital age, books took time to become best sellers, and success relied heavily on good reviews and word of mouth publicity. Contrast that with today, with publishing companies selecting manuscripts for publication based on their potential to become best sellers, and then selling them in bulk to book stores to be put on display. Likewise, the roles of authors have changed to reflect this aggressive approach. “The system is so perverse that young writers grow up seeing authors on television and in the newspaper all the time,” Montero said. Authors are by and large considered celebrities, a development that Montero considers damaging for developing writers. “Rather than strive to one day write the best book ever, which is what every first-time writer ought to set out to do, what many grab for instead is something substandard,” she said. Rather than devote themselves to improving their craft, many young writers try to emulate the image of the celebrity author and produce work they think would have the broadest appeal. “They spend more time being writers than writing,” she said. But Montero is anything but a passive observer – when she wasn’t delivering lectures or hiking Utah’s nearby mountain trails, Montero spent her visit guiding the developing writers of BYU. Under her direction, students took part in a course of five two-hour classes, writing fiction, essays and even journalism articles, all in Spanish. Each class dedicated time to reading work aloud and receiving feedback, and students submitted final short stories to demonstrate what they’d learned during their short time together. Montero was impressed with the level of dedication shown by her students, who often wrote more and did more revisions of their work than was required for credit. Her students were equally impressed with their instructor. “She hasn’t lost her perspective, and she has been able to guide us well. I’ve enjoyed how clearly she expresses her ideas,” said Alejandro Lopez, a Spanish literature master’s student. He noted that he saw an improvement in his own work, which he attributed to Montero’s influence and writing assignments. “But,” she warned, “this doesn’t mean that that writer is a good one.” Passion alone will not see a writer through. “We need to write, but we also need to read,” Montero said, as part of her advice on becoming a good writer. “To read and to write are two sides of the same coin. Every writer I know is first and foremost a reader. We are readers who write.” Reading, she explained, exposes writers to new ideas and helps them to hone their own craft by taking cues from others. As such, students in her class read essays and short stories from some of the most influential modern authors of the Spanish language, and class discussions focused on dissecting the techniques employed in each work and their affect. Montero revealed that readers can expect more in the way of Bruna Husky novels; she still has many plans for the detective of the future. But before she can return to Madrid 2109, Montero has other novels to translate from her head to paper, more experiences of humanity to study out and develop into novels as she tries to understand them better. Closing her second lecture and her visit to BYU, Montero said, “I know now that I write in order to try and lend evil and pain meaning, which I know in reality they don’t have.” She is not alone in this effort, and she held that on one level or another, all human beings have the need to narrate their own lives, giving meaning to their experiences. Fiction is simply one of the more obvious narrations. “There will always be fiction. It will always exist, one way or another,” she said. “As long as pain exists, writers and readers will exist.” Because fiction, she maintained, is the tool we use to turn tragedy into beauty.